Today's tech giants have grown to a point where they have the capability to build almost anything. However, a successful product also requires the capability to distribute the product at scale and, most importantly, the motivation to invest resources to create the best possible ecosystem. It is fairly easy to understand a company's capabilities, but gauging motivations can be challenging. Understanding business models can give us great insight about motivations and, consequently, product strategy. With this background, let's attempt to compare the capabilities and motivations of Apple, Google and Amazon with respect to the living room. Apple's business model is fairly easy to understand -- Apple makes money by selling high-margin devices and everything else exists to make their devices more attractive to consumers. 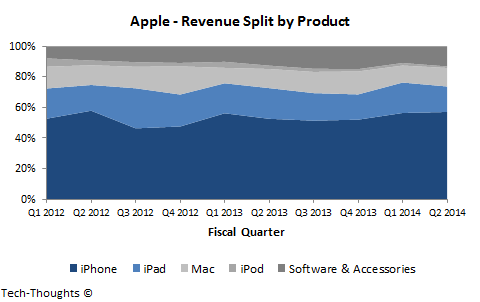 In fact, iTunes and the Appstore make up less than 10% of Apple's total revenues and an insignificant proportion of their profits (this is why I find it puzzling when industry observers discuss Apple profit potential from mobile payments). Apple has been a popular choice to disrupt the living room for some time now with an enhanced version of Apple TV (let's call it Apple TV+). They certainly have the capabilities to build Apple TV+ and their distribution reach cannot be questioned. But do they have the motivation to invest in expanding the entertainment ecosystem for Apple TV+? I believe the following chart answers that question. 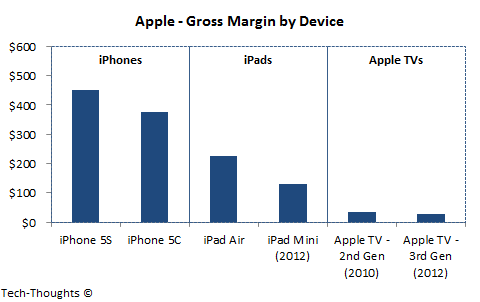 Apple makes a gross margin of ~$30-$35 on each Apple TV, as compared to hundreds of dollars on each iOS device. Even if the product is refreshed every other year, the gross margin increases to a measly ~$50 with a 10-15% BOM reduction. In other words, Apple would have to sell 3-4 Apple TVs to make the same gross profit as it does on a single iPad Mini (non-retina). That doesn't seem like the greatest motivator. But if this is the case, why does Apple TV even exist? The simple answer is that it isn't a profit center, but a way to strengthen the Apple ecosystem for their best customers. An integrated TV set would seem more attractive, but long refresh cycles make that a difficult business. What about Google? Are they motivated to invest in an ecosystem to invade the living room? Google's business model is slightly more complex than Apple's -- their goal is to attract consumers to free services and make money on advertising. 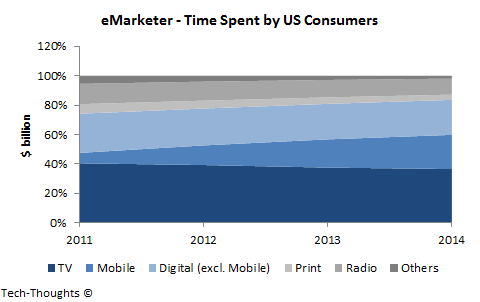 Cheap, effective hardware just makes it easier to attract these consumers. 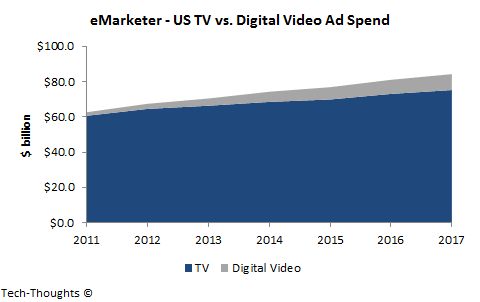 Is TV advertising an attractive market for Google? Again, the following charts should answer this question. Clearly, TV still attracts a major chunk of advertising spend and it is expected to retain its position because of its hold over consumer attention. 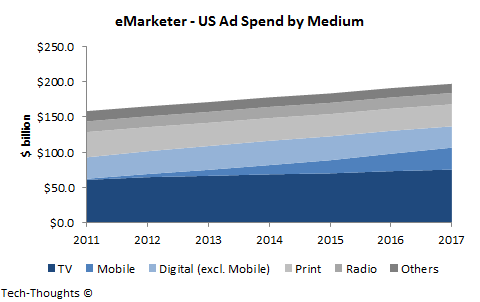 Today, Google is the leader in mobile, desktop and digital video advertising (although Facebook is catching up fast on mobile). TV advertising remains a vast, untapped opportunity, i.e. Google is highly motivated to find a way into the living room. Google certainly has the motivations and capability to build a product/ecosystem to go after this opportunity, but distribution remains a challenge. Creating a modular ecosystem (like Android) is difficult at this time as OEMs are focused on building their own platforms (a modular ecosystem could still be a long-term play). Meanwhile, an integrated product would offer superior performance (at this point) and make product iteration easier. This would force Google to distribute the hardware as well, which isn't a major strength for them. Of course, Google could always wait for a winning platform to emerge and create over-the-top solutions/services that hijack the platform (similar to Chrome on PC), but that's a longer game. 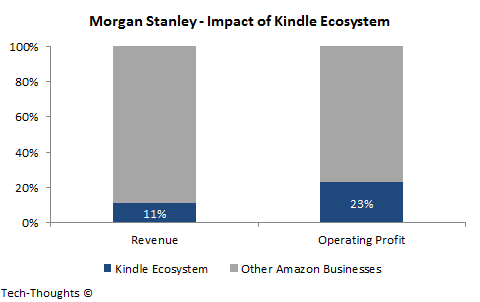 Based on this, Amazon is the most likely source of a disruption to the established TV/console paradigm. Of course, this analysis is only valid if we assume that this disruption requires dedicated TV-focused hardware. It's entirely possible that smart mobile devices are already disrupting consoles. In this case, are devices like Apple TV and Fire TV limited to a niche market?